I have to say having a second new baby is so much more rewarding than having a first nb baby was. You may be thinking, why would anyone say such a thing? Well here are the reasons why I am enjoying having a new baby more this time around. When you first bring home baby number 1, everything is new, and scary. Even the most prepared parent still has a lot to learn. So you second guess yourself and your instincts a lot. Also it's just you and baby... all day long. Those breastfeeding sessions seem a lot longer when the only distraction is PBS and you are constantly staring at baby wondering if you are doing it right. Walks to the park are you talking to a nb baby while people stare at you. Breastfeeding in public... oh boy... scary stuff at first. Diaper changes... in public? No way. Honestly it wasn't until Bug was about 8 months that leaving the house with him became fun, because suddenly he was looking around, crawling, cooing, even saying words and it finally felt like I wasn't just talking to hear myself talk. Then you bring home baby number 2. If you are like us, your first born is heading off to Kindergarten when you bring home that new baby. Now you are an old pro at not just baby stuff but being a Mom or Dad in general. Now you get to share the ups and downs and fun of a new baby with your older child. You get to see the love blossom in their eyes, knowing they are so in love with this baby. 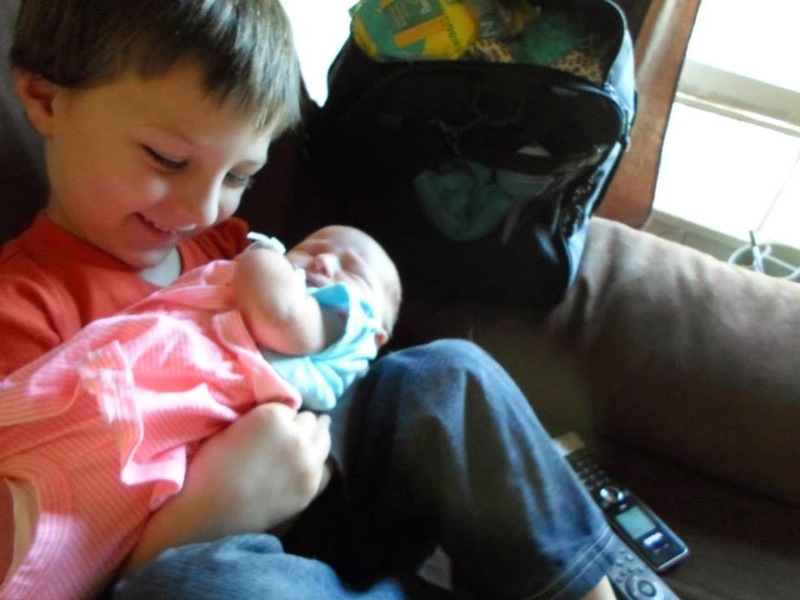 You get to see them grow to be a big brother or sister, not just an only kid. You get to enjoy all the fun of the nb stage all over again but this time instead of with fear or hesitance, with nostalgia, enjoying not only what newbie is doing but remembering what your eldest did when they were that age. Now walks to the park are a 5 year old running around having a blast while you and babykins lay on a blanket by the water. Now breastfeeding and diaper changes in public are easy peasy. I can change a diaper (even cloth prefold with cover) in under 1 min. I can change a toddlers diaper standing up in under 2 mins. ( I also teach preschool so that helps). Now don't get me wrong, two kids especially a school age kid and a nb baby is twice the trouble, twice the mess, and twice the noise, and twice the work, but it's twice the reward too. The biggest reason why I am enjoying this time around more is less to do with baby number 2 and almost all to do with baby number 1. They suddenly are the big kid. This baby, your baby, the child that was your whole world for 5 years is suddenly a big boy (or girl). They suddenly start doing things on their own, helping change diapers, clean up, make lunch. You see them begin to be a real person and not just a baby. I have loved watching Bug grow and change over the last 8 weeks. He is just becoming such an amazing person. I look forward to watching River do the same.